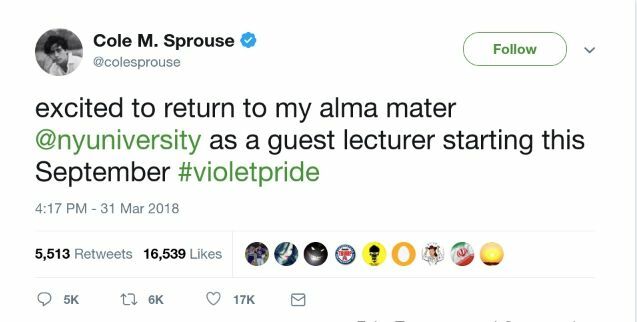 Gallatin graduate and former Disney star Cole Sprouse announced last night that he will be returning to campus as a guest lecturer for the Fall 2018 semester. The course – which will be offered through Tisch next semester – is titled: "Modern Photography: Art in the Age of Instagram". 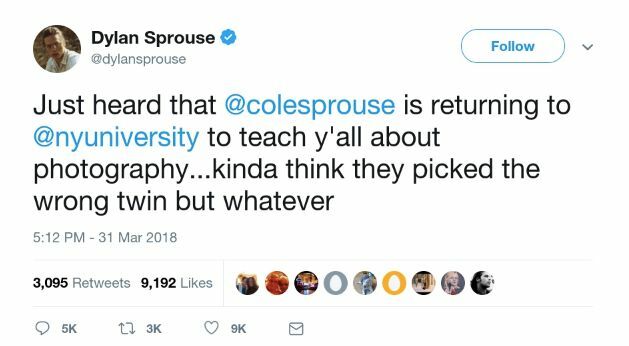 Sprouse – who is currently starring in the CW's Riverdale – graduated from NYU in 2015, where he specialized in Archeology though he also expressed an interest in Photography. He has since pursued it professionally, shooting assignments for Teen Vogue and W Magazine. He is represented by LGA management and his portfolio can be found here. Riverdale has just wrapped its most recent season, allowing this prized NYU alum to return to Washington Square Park and share his knowledge during the show's hiatus. The Tab reached out to President Hamilton for comment and are awaiting a response. However, students are reacting with a lot of excitement, with Photography & Imaging major April Narran telling the Tab: "Cole is definitely the hotter twin and the way Instagram has changed photography is one of the great issues of our time. I need to be in his class!"